Jamie Elliott kicked 35 goals in 2015 to edge out Travis Cloke (34) and win the Gordon Coventry Award. 2015 Gordon Coventry Award winner Jamie Elliott stands just five centimetres shorter than the legendary centre half-forward in which Collingwood’s leading goal kicking award is named after. 74 years after Coventry played his last game, football is now dominated by tall and powerfully built athletes. Elliott would have been considered reasonably tall in Coventry’s time, however in 2015 he is one of the most dangerous small forwards in the competition. So dangerous in fact, that the 23-year-old has this year dethroned four-time winner Travis Cloke as Collingwood’s leading goal kicker. Elliott kicked 35 goals in 2015, ahead of Cloke’s 34 and 27 each from Jesse White and Alex Fasolo. While lingering contract negotiations have the potential to threaten the form of the best of players, Collingwood and Elliott were determined to not let this be the case. Five games into the season the livewire forward put pen to paper, ensuring that he will remain a Magpie until the end of 2018. "I couldn't see myself anywhere else," Elliott told the media. "It's basically my second family and I hold it really close to my heart … I just love it here," he said. From this point on, Elliott was able to let his football do the talking. 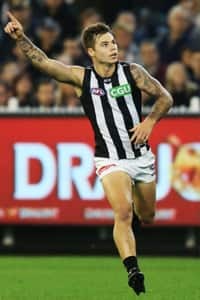 Already a cult figure thanks to his extraordinary leaping ability, Elliott added to his reputation as one of the most exciting players in the game with nominations for the AFL Goal of the Year coming in rounds four and 21. Outstanding feats aside, Elliott’s consistency in 2015 showed his potency in what was an at times unpredictable Collingwood forward line. He kicked goals in all but four of his 20 home and away games, with back-to-back bags of five recorded in Collingwood’s victories over Gold Coast and North Melbourne in round eight and nine. The flow of goals continued late into the season as Elliott moved past the injured Cloke to collect his first piece of silverware on Copeland Trophy night since being awarded the Harry Collier Trophy for best first year player in 2012.